This article will aid you to remove the Ursnif Trojan (Purolator phishing scam) completely. Follow the Trojan horse removal instructions given at the end of the article. Ursnif Trojan is a banking Trojan horse that is recently being spread via a Purolator phishing scam with a message stating that you have a package. one of the most spread messages, says: Purolator have a package for you. Pop-ups that show constantly can also lock your browser on that page. E-mail campaigns are also spreading the phishing scam. You might experience redirects. The browser can be shut down without any negative impact, but in other cases your system and browser could get affected with the Ursnif Trojan. Most variants of this scam feature a background image that aims to utilize the brand and logo of Purolator shipping company. Short Description Phishing scam which is trying to take you (with click-bait and social engineering tactics) to a Purolator Phishing page that spreads the Ursnif Trojan or other viruses. Symptoms Pop-up boxes, messages, and redirects appear in your browser or such are send in your email. It is not excluded for there to be a lockscreen function among these that keeps prompting you to click a link. User Experience Join Our Forum to Discuss Ursnif Trojan horse. Browsing the Web can be dangerous, especially when you reach new and unknown websites by causally browsing and they turn out to be malicious. Clicking on advertisements or targeted content could have hidden links that redirect you to dubious online places. Other websites could be filled with advertisements and redirect links and you could land on a page such as the Ursnif Trojan (Purolator Phishing) one. Your parcel is registered with the branch of Canada Post. Our tracking system is refreshed every 24 hours to provide you with the most current information available about the geographic position and status of your item. That is one of the messages that spread via email and is seen above the last paragraph in this section of the article. If you have downloaded a .zip file that you are suspicious of, you can always check its contents for malware with ZipeZip Online Scanner. However, do not be tempted to open any links from emails especially if they look like the one discussed above or if they are sent from an unknown (unverified) source. Ursnif Trojan is being pushed by a number of Purolator phishing scam messages. 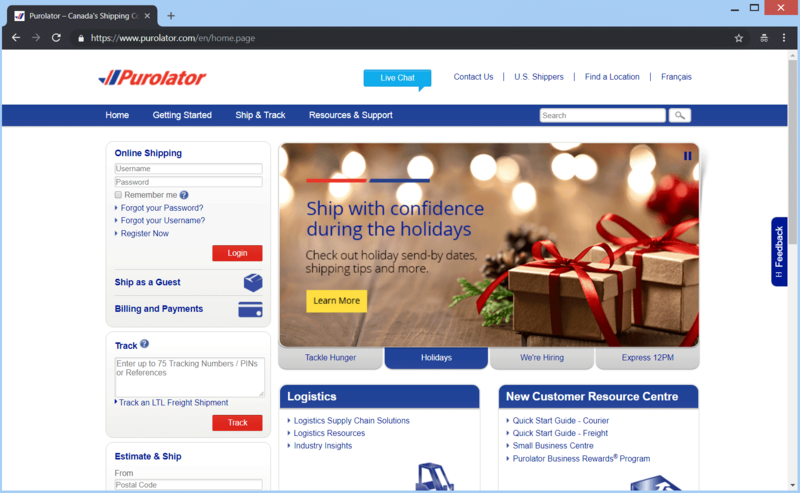 The scam has a few, different landing pages, which use the brand, logo, design and fonts of Purolator, including their official site’s text and element placement. All of this is done to try to convince you into clicking somewhere and entering your credential details on a phishing page. Thus your account and profile data can get stolen and hijacked or just spoofed so they can be sold somewhere. If you indeed click on the spot which cybercriminals wish you to click, you could get redirected to a phishing page and/or get your computer system infected with the Ursnif Trojan (Purolator Phishing) threat. PUROLATOR HAVE A PACKAGE FOR YOU! Download the Purolator Label containing your tracking number. After downloading your label,open the label information and locate your tracking number. You may reschedule a redeliver from us or arrange a pick up from our location. 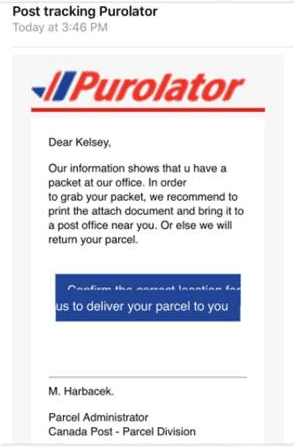 All of these Ursnif Trojan (Purolator Phishing) scams could also be displayed with pop-ups as alerts around websites, applications, emails and other means. Ursnif v3 Banking Trojan has been spotted to have sophisticated targeting techniques in the past so it is no wonder that it has decided to use a phishing scam for one of Canada’s most known shipping services. In case there is a telephone number present somewhere on the site, know that the criminals standing on the other end of the telephone line will try to trick you in giving them information related to Purolator or that is even more personal. Do not believe if they present themselves as employees in Purolator or another notable company. However, know that the Ursnif Trojan might use a silence dropper technique that could trigger by just opening the Purolator Phishing scam page. Browsers you have installed or your computer screen can become locked and may seem like your whole screen is blocked and totally inaccessible. In such a situation, you could try clicking the “Windows” button and combinations such as “Ctrl+Alt+Del” or even the “Close” button to check if you still can interact with your computer device. You could also get prompted to download and install a tool which might be the Ursnif Trojan or some other malware. Keep in mind that it is all part of the scam and you shouldn’t follow any instructions given on your computer screen. If you see any similar messages, know that they aren’t coming from Purolator. Also, no matter how many pop-ups, alerts and message boxes are shown, try to remember that this is a sophisticated scam that wants to harm your computer or steal credentials, banking data or other information from you. Ursnif Trojan (Purolator Phishing) Scam – How to Avoid? In this section, you will find out a simple set of rules and guidelines to follow in order to prevent yourself from falling in a trap related to Ursnif Trojan (Purolator phishing) scam and other related threats. So, if you are reading this article, you should now know that there is a multitude of scams involving a Purolator shipment or parcel notifications. Below you will see what you should do. The guideline rules listed above were constructed by the SensorsTechForum team, via a research done on the matter. These rules are based on common sense and depending on the various scams related to Purolator. To remove the Ursnif Trojan (Purolator Phishing) scam and its related Trojan horse files manually from your PC, follow the step-by-step removal instructions provided below. If the manual removal guide does not get rid of the scam and its redirects completely, you should search for and remove any leftover items with an advanced anti-malware tool. Software like that will keep your system secure in the future. Threats such as Ursnif Trojan horse may be persistent. They tend to re-appear if not fully deleted. A malware removal tool like Combo Cleaner will help you to remove malicious programs, saving you the time and the struggle of tracking down numerous malicious files. Threats such as Ursnif Trojan horse may be persistent on your system. They tend to re-appear if not fully deleted. A malware removal tool like SpyHunter will help you to remove malicious programs, saving you the time and the struggle of tracking down numerous malicious files. Note! Your computer system may be affected by Ursnif Trojan horse and other threats. SpyHunter is a powerful malware removal tool designed to help users with in-depth system security analysis, detection and removal of threats such as Ursnif Trojan horse. 1. Install SpyHunter to scan for Ursnif Trojan horse and remove them. 2. Scan with SpyHunter, Detect and Remove Ursnif Trojan horse. Ransomware infections and Ursnif Trojan horse aim to encrypt your files using an encryption algorithm which may be very difficult to decrypt. This is why we have suggested several alternative methods that may help you go around direct decryption and try to restore your files. Bear in mind that these methods may not be 100% effective but may also help you a little or a lot in different situations. Note! Your computer system may be affected by Ursnif Trojan horse or other threats. Remove Ursnif Trojan horse by cleaning your Browser and Registry. Fix registry entries created by Ursnif Trojan horse on your PC. Combo Cleaner is a powerful malware removal tool designed to help users with in-depth system security analysis, detection and removal of threats such as Ursnif Trojan horse. Step 5: In the Applications menu, look for any suspicious app or an app with a name, similar or identical to Ursnif Trojan horse. If you find it, right-click on the app and select “Move to Trash”. Step 6: Select Accounts, after which click on the Login Items preference. Your Mac will then show you a list of items that start automatically when you log in. Look for any suspicious apps identical or similar to Ursnif Trojan horse. Check the app you want to stop from running automatically and then select on the Minus (“–“) icon to hide it. Remove Ursnif Trojan horse – related extensions from your Mac’s browsers. A pop-up window will appear asking for confirmation to uninstall the extension. Select ‘Uninstall’ again, and the Ursnif Trojan horse will be removed. When you are facing problems on your Mac as a result of unwanted scripts and programs such as Ursnif Trojan horse, the recommended way of eliminating the threat is by using an anti-malware program. Combo Cleaner offers advanced security features along with other modules that will improve your Mac’s security and protect it in the future. Hey !, I found this information for you: "Remove Ursnif Trojan (Purolator Phishing) Scam". Here is the website link: https://sensorstechforum.com/remove-ursnif-trojan-purolator-phishing-scam/. Thank you.